A tiny space probe was dispatched from Earth this morning for a tantalizing tour of comets -- the frozen time capsules that hold the primordial building blocks left over from the creation of our solar system. 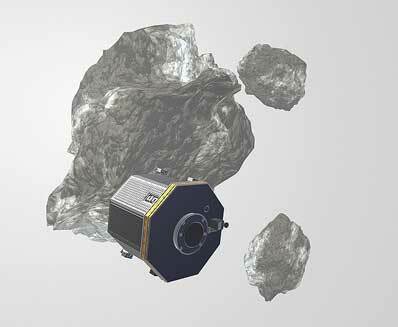 The $159 million Comet Nucleus Tour mission, dubbed CONTOUR, will encounter at least two comets to give scientists their closest look at the hearts of these dirty snowballs. "Humankind has looked at comets for centuries, and yet we know amazingly little about them," said Dr. Colleen Hartman, director of NASA's solar system exploration division. "Comets may well have brought much of the Earth's oceans and the Earth's atmosphere, as well as the carbon-based molecules to the Earth's surface. If it were not for comets, perhaps we wouldn't even be here," said Dr. Donald Yeomans, CONTOUR science team co-investigator from NASA's Jet Propulsion Laboratory. "They are the most abundant and least understood bodies in our solar system, and they're important because they are the best-preserved pieces of the solid materials out of which the planets formed 4.6 billion years ago," said Dr. Joseph Veverka, the CONTOUR principal investigator from Cornell University. 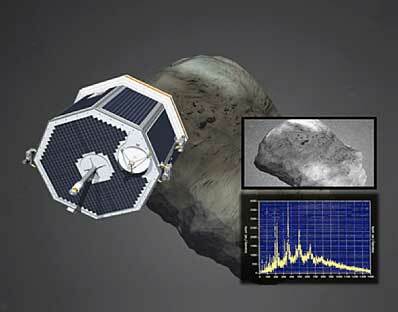 CONTOUR is fitted with two cameras and two science instruments to snap the clearest pictures ever taken of the comets' hearts and analyze the dust and gases spewing from the mysterious objects in an effort to understand their structure, composition and how they work. Scientists also want to know how comets are chemically diverse from one another. "The reason we want to know that is to address some important questions, not only concerning comets themselves, but concerning the early history of the Earth and the role that comets may have played in it. These are questions really about the chemistry of our Earth and questions about us," Veverka said. "Can we demonstrate that much of the water that exists in our lakes, rivers and oceans was actually brought to the Earth by comets? Similarly, is it plausible that the air we breathe in our atmosphere actually once was comet stuff? Is it likely that the original input of the molecules that led to the origin of life on the Earth came from comets? Are we, indeed, the progeny of comets? These are some of the exciting questions that the chemical analyses on CONTOUR will attempt to answer." The spacecraft's voyage began at precisely 2:47:41 a.m. EDT (0647:41 GMT) today when a Boeing Delta 2 rocket blasted off from pad 17A at Cape Canaveral. The three-stage expendable launcher hurled CONTOUR into an extremely elliptical orbit ranging from about 115 miles to 70,000 miles -- a third of the way to the moon -- during a 63-minute flight that started on Florida's East Coast and ended on the other side of the globe, north of Australia. The probe will remain in Earth orbit for six weeks, making a looping orbit every one-and-three-quarters days. At 4:46 a.m. EDT August 15, while cruising 139 miles above the Indian Ocean, a solid-fueled kick motor on CONTOUR will ignite for a 50-second firing to propel the probe on a Sun-orbiting, Earth-return trajectory, the next leg of its innovative trek called an "indirect launch mode." CONTOUR will return to the Earth on August 15, 2003, passing within 36,000 miles to use the planet's gravity as a steering wheel to change the craft's orbit to put it on course to rendezvous with comet Encke on November 12, 2003. "The genius of the CONTOUR mission design is that we're not going out and chasing comets around the solar system -- we're using Earth swing-bys to allow them to come to us," Yeomans said. "So, the encounters themselves take place very close to the Earth. That makes communications easy -- that's why the antenna on the spacecraft is so small. But it also allows ground-based astronomers to participate in a very meaningful way. They can get images of the coma, the atmosphere of the comet, and the large-scale structures at the same time that the CONTOUR spacecraft is actually looking at the nucleus itself." Flying backwards with its five-layer Nextel and Kevlar dust and debris shield oriented to protect the craft, CONTOUR will pass 62 miles from Encke's heart during the 55,000 mile per hour encounter. "We're basically flying a straight-line trajectory past the comet," Veverka explained. "We come in with the Sun behind us so we see Encke fully illuminated, and at closest approach we would see half-illuminated Encke, and then, going away from Encke, we are essentially looking into the Sun, so we're seeing a crescent illuminated Encke. "Our plan is to take data both on approach and, when we leave the comet, the chemical instruments will get most of our data over a period of about an hour around closest approach. Most of the high-resolution images occur very quickly, within less than a minute to closest approach. The reason, of course, is that...the flyby speed is almost 30 kilometers per second which, in normal terms, I think is about 55 thousand miles an hour. So we have to do things very quickly." Discovered in 1786, Encke is an old comet that has made thousands of trips around the Sun, and believed to be about five miles in length. 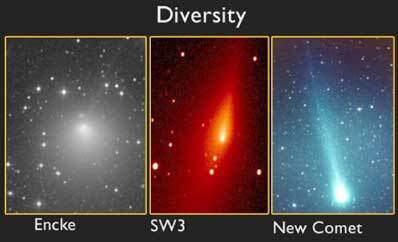 "The thing to remember about comet Encke is that it is a highly evolved comet. So, although it does have gases and dust coming out forming an atmospheric coma, Encke really does not have the kind of classical tail that you associate with a very bright comet," Veverka said. "Encke is a tough, blackened old comet that goes around the Sun every 3.3 years. It's the second-closest periodic comet to the Sun, so it's evolved a great deal," said Yeomans. "It's what we call a transition object, a comet that likely is on its way from being a comet that outgases to, perhaps, an object that has lost its ability to outgas and cannot be differentiated from an asteroid. It's a comet that is on its way to being an asteroidal-type object." During the encounter the images and data collected by CONTOUR will be stored onboard for later transmission to Earth. "We will be monitoring the health of the spacecraft as it flies through Encke, but very low data rates. But we will know exactly what's going on with it. If it's hit with any dust particles or things like that, we should be able to pick that up from a change in the motion," said Dr. Robert Farquhar, the CONTOUR mission director from The Johns Hopkins University Applied Physics Laboratory. Once past Encke, CONTOUR's orbit will bring the spacecraft back to Earth for another gravity-assist swing-by on August 14, 2004 at an altitude of 24,600 miles. 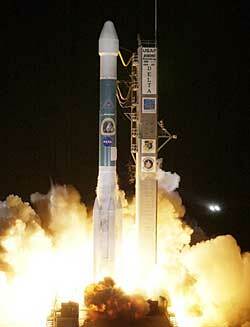 This puts the probe on an "out of plane" orbit, setting up for another Earth encounter on February 10, 2005 at 133,980 miles. Exactly one year later on February 10, 2006, CONTOUR will pass just 18,600 miles from the planet to receive the final boost needed to reach Schwassmann-Wachmann 3 on June 19, 2006 -- a comet vastly different than Encke. A young, fragile comet that has broken into pieces, Schwassmann-Wachmann 3 could give scientists the opportunity to observe and study the insides of the nucleus. "During this flyby, we hope not only to see the surface of a comet nucleus, but to expose for us the interior parts of what a comet really is like on the inside," Veverka said. "It split off at least three pieces in late 1995 and...it's put together in a very fragile sense. It's probably a rubble pile-type structure that is held together by little more than its own self-gravity," Yeomans said. "If, indeed, some of these pieces have left the interior of the main nucleus exposed, then we'll get a chance to look at the structure of the interior of this comet." The comet, found in 1930, takes about five-and-a-half years to orbit the Sun. After its recent break-up, one piece can no longer be seen. The largest chunk is about a mile across. Controllers have not decided exactly how close CONTOUR will come to Schwassmann-Wachmann 3, but Veverka says it will be between approximately 125 and 185 miles. The flyby speed, although still remarkably fast, will be roughly half of the Encke encounter. Yeomans says since both comets come close Earth, they can be seen with a pair of binoculars. "Schwassmann-Wachmann 3, for example, makes its closest approach to Earth on May 14 (2006), just prior to the encounter itself, and that is the fifth-closest approach of a known comet in this century, so we're really taking advantage of the fact that these are very close approaches for these target comets." Three months after the Schwassmann-Wachmann 3 flyby, on September 30, 2006, the CONTOUR mission is supposed to end. But NASA could decide to continue funding the mission, sending it to several more comets by performing more Earth swing-bys. "The only life-limiting part of the spacecraft is the amount of fuel that we have managed to put onboard," said Mary Chiu, the CONTOUR project manager from The Johns Hopkins University Applied Physics Laboratory. In order to keep the mission cost down, CONTOUR will go into hibernation for long periods of time, only waking up during Earth swing-bys and the comet encounters. "What happens then is that we turn off almost everything on the spacecraft except for the heaters and the receivers. That means that we don't have to maintain a large operations team during that time and we don't have to make use of the (Deep Space Network tracking) antennas," Farquhar said. "The hibernation is about 60 percent of the mission. When we go down in between the comet encounters for the later target...between launch and Encke we will actually have a larger mission operations staff just because it's the first flyby. Then, after Encke, after we've learned quite a bit about flying by the comet, we will go down to a very small mission operations team and that will be less than half of a normal operations team," Chiu said. If CONTOUR gets an extended lease on life, scientists already have a wish list of additional comets to encounter. "We do have several...potential targets that would come up in 2008. One is comet d'Arrest, another is comet Boethin, and then, something that may be a dead comet is Wilson-Harrington. These are three potential targets," said Farquhar. "What we are really hopeful of is that someone will be able to discover a bright new comet like they found Hale Bopp, and we could get to that. We have a lot of potential to get to a new comet and that is something that we would really like to do." Launch windows - See the daily launch opportunities for CONTOUR. CONTOUR - Technical look at the spacecraft and its systems. Science goals - The science of CONTOUR aims at a closer look at comet diversity. 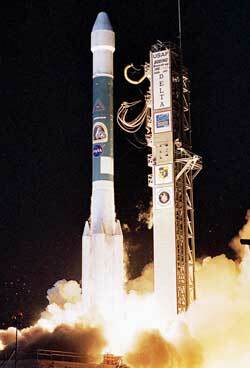 Delta 2 rocket - Overview of the Delta 2 7425-model rocket used in this launch. Delta manufacturing - Map of where the parts for Delta 2 rockets are made. Hardware flow - Illustration of how Delta 2s come together at the Cape.